So getting back into model railways is a little more difficult that the simple set up I had as a kid, its come a long way and instead of a simple 12v circuit we now have Digital Command Control (DCC). It runs on an 18v AC current and each locomotive, point or accessory can be controlled via binary signals sent though the rails. This means you can control multiple devices on a single track instead of a train running round in the direction of the DC circuit. To decode these signals, people purchase what are known as “Accessory Decoders” and they are really expensive, the ones I found could control 4 devices for about £40. Step in Ardunio an a diode and an opto-isolator and evening or two coding and I have a Accessory decoder for about £18 that can control around 15 devices or “accessories”. I cant wait to get this fully hooked up, but after taking it to a friends who has an digital DCC Decoder and an LCD screen we managed to get some building lights turning on and off as well as point changing. 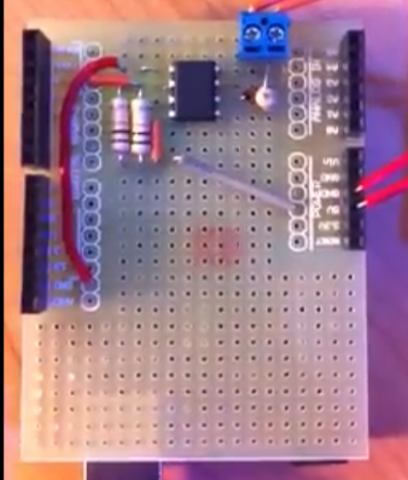 This entry was posted in Micro Electronics, Model Railways and tagged arduino, dcc control, model railways.